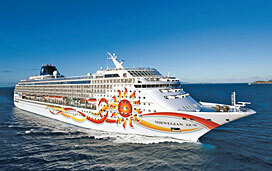 Norwegian Sun Passengers Steamed Over Altered Cruise -- but Do They Have a Case? Some two months after their troubled seven-night cruise aboard Norwegian Sun came to an end, a number of passengers continue to voice displeasure with NCL's response to the matter. During the December 4 voyage, problems with the starboard propulsion motor limited the ship's top speed, though it caused no disruption to any services onboard. However, the reduced propulsion meant that Sun could no longer reach St. Thomas and St. Maarten as originally planned. Instead, the ship visited Samana, in the Dominican Republic, and Great Stirrup Cay, NCL's private resort island. For some, the port swap was a less than blockbuster deal. "We paid a lot of money to visit St. Maarten and St. Thomas, but we never made it there," wrote the Rev. Bill Shoneman in an e-mail last week to Cruise Critic. "On top of that, the captain and some senior managers were unapologetic and extremely unprofessional. We were told at one point to 'stop complaining,'" he said. "This change in itinerary really upset a lot of the passengers that had been planning on doing their Christmas shopping at St. Thomas," wrote G8R62 in her Cruise Critic member review. The crux of many passengers' issue with Samana was its lack of infrastructure compared with the major tourist areas St. Thomas and St. Maarten. After the initial announcement, passengers showed their disapproval by amassing in the atrium and theater, where they tried to plead their case. Pictures of the meetings have been posted on the Web, including a selection taken by passenger Bob Hind. Hind noted that passengers were frustrated at the captain's lack of responsiveness. NCL declined to comment on the meetings. To assuage the ire, NCL told Cruise Critic via a press release that it offered a $100-per-cabin onboard credit, wine with dinner one night, rum punch one afternoon, free photos from the onboard gallery, free use of the Great Stirrup Cay's Hippo Slide (one of the world's largest inflatable water slides; regularly $5 per ride, $20 for unlimited) and a credit, equal to 30 percent of the cruise fare paid, to be used on a future cruise. Port taxes and fees for the missed ports were also refunded. We asked NCL for additional comment about its standard compensation policy when itineraries are shifted due to mechanical issues and if the line had received a substantial number of complaints. A spokeswoman declined to comment, saying the press release covered most of our questions. The compensation wasn't nearly enough for some Sun passengers, however. "Our hope is that NCL will take this more seriously and issue a refund check to us," said Roger and Georgia Pilgrim via e-mail. "Norwegian Cruise Line has shown nothing but a total lack of caring that we did not get what we paid for . . . .getting to St. Thomas and St. Maarten." Others mentioned not knowing about the perks until it was too late to use them. "With the exception of the photos, they didn't do a great job of letting the passengers know about them ahead of time," posted IsetVB on the message boards. "It was like they were tossing these things one at a time and waiting for a reaction to each." Once back onshore, one passenger was so frustrated by the experience that he/she created a Web site, mybadcruise.com, with the goal of "ensuring that NCL is held accountable to those people for its inaction and inability to uphold its end of travel contract." Mybadcruise is also proposing a refund, but it's unclear if the request is for full or partial recompense. In addition to showcasing 10 complaints from cruisers, the site suggests boycotting NCL, calls for an investigation by Congress and asks impacted cruisers to lodge a complaint with the Federal Trade Commission, the government organization tasked with protecting consumers. The hope is that if enough complaints are submitted, the FTC will take notice and investigate. Attempts to reach the creator(s) of the site failed after the Contact Us page malfunctioned repeatedly. When asked if it was aware of mybadcruise.com, NCL declined to comment. Not all passengers on the re-routed ship were angry with the line's handling. "NCL quickly organized tenders, events and shore excursions for the new ports of call, provided a few extra complimentary things onboard and gave everyone $100 credit and 30 percent off another cruise," wrote Laurel212 in a review. Laurel212's biggest complaint was not with NCL, but with her cruise mates' response. "I was embarrassed by the way I saw some of my fellow passengers speaking to innocent crew members. The rudeness, unreasonableness of quite a few customers left a bad taste in my mouth. The crew must have the patience of 'Job.' I understand being disappointed by the changes, but I honestly believe some people's hysteria was put on entirely as an attempt to receive a free cruise they well knew they weren't going to get." Laurel212 continued, referencing the passengers on the now-infamous Carnival Splendor cruise: "Those Carnival passengers drifted without power for days, but you think you should get a full refund for the daunting hardship of having to go to a private island barbecue?" STARFISH*4, who was also on the cruise, agreed that the compensation was fair. "We felt more than compensated for the missed ports and weren't expecting anything really.... It was utter chaos for the week with disgruntled passengers demanding this and that -- some passengers really ruined the rest of the cruise for others with their constant bickering and complaining." So what does the line actually owe the passengers? In a response to a complaint letter about the December 4 cruise, NCL noted that "our brochures and Cruise Ticket Contract reflect that we may have to change a ship's itinerary for various reasons, including mechanical difficulties. Nevertheless, we share your desire to have enjoyed these much-awaited ports of call on your cruise vacation; but these types of diversions are occasionally necessary." When itineraries are changed due to mechanical issues, passengers may be entitled to refunds on prepaid port taxes or fees. But beyond the refunds, NCL would be obligated to give nothing, based on the contract signed by all passengers. And in general, when trouble arises at sea, it's very rare that we see lines issuing full refunds or free future cruises. It is not, however, unheard of. Passengers on November's ill-fated Carnival Splendor cruise received a full refund and a free future cruise. Passengers who experienced the violent listing episode of Royal Caribbean's Brilliance of the Seas, which injured some 138 passengers and caused damage to cabins and public in December, also were given a full refund. Now it's your turn: Given the rules for cruise line liability, do you think NCL was fair with its compensation to Sun cruisers? Sound off here.